This was the first year for the Bobcat Trail Marathon, at Burr Oak State Park. The weather was a perfect low 50's for a race start and hovered around 60 all day. The course was pretty tough with hills around every corner and some really cool technical spots. The aid stations were packed with extremely friendly and enthusiastic volunteers who cheered me on like I was winning the race at each stop. Even weeks before the race, the race directors kept all runners up to date with the latest information via emails. and they couldn't have picked a more beautiful place to have it. Everything about this race was top notch, and it was great to be part of the inaugural race day for such a great event. I will be back. My race report starts on the Saturday afternoon before the race. As I mentioned in my last race report, Dan Brown was running this race with me again. It's his second marathon in 3 weeks... No I mean his second marathon... in 3 weeks. He ran his first marathon 3 weeks ago at the 30th Annual Columbus Marathon. Somehow, I suckered him into doing Bobcat with me 3 weeks later. I figured since he would have already been trained, he might as well... :) It worked and he ended up beating me by 20 some seconds. :) Way to go Dan! He arrived at my house around 3pm on Saturday and I had my bags packed, ready to go. We had almost 2 hours of driving time ahead of us, so we didn't waste time. We put all of our stuff in the car, talked to Jen and the girls for a few minutes, and then we were headed south to Glouster, Ohio. The drive was very pretty and we just jammed to music with the windows down having a great time. We arrived around 5:30 or so and got checked in. As soon as we checked in, we went down to get our race numbers and pick up our race packets. Packets were real good; we all got a nice technical t-shirt, some peanut butter granola samples and some power bars. Vertical Runner had a booth setup and I got a few things from them and purchased two big bags of the Crazy Monkey Baking stand (very good stuff). Before panic was able to set in I remembered that Vertical Runner was setting up a shoe display to sell shoes for $20 a pair. What are the chances? :) I went down and bought a pair of New Balance 747's (glowing white) road shoes before we headed out for dinner. I was gonna look like the noob tomorrow morning, and I didn't care. After I bought the shoes, Dan and I headed into Glouster to get some pizza at a local pizza parlor, named Little Italy and it was waaaay good. We watched the Buckeyes football game on the TV and chowed down on some pizza. After dinner we headed back, hung out for a while, got a quick beer at the bar, and then headed back to the room to crash. We woke up and got checked out before heading to the starting line. I saw Kim, and another local Dillon runner named Mike McCune (a good buddy to my good buddy, Mark). We were all just standing around waiting for the race to start. I was looking like a noob in my shiny new shoes. :) The RD's were talking to the crowd and explaining the course a bit and then the siren sounded for the race to begin at 8am sharp. We started running! Once into the woods we were welcomed with our scenery for the next few hours. It was a large calm lake with a few fishermen floating out on their bass boats. The sun was perfectly placed and it made for a perfect race morning. These were more beautiful miles through the rolling hills. Right around here, Dan and I took a little detour into a swamp. We were just talking between ourselves as we came off of a trail at one point and were running along a short road section. As we were headed back towards another trail into the woods, our feet began to sink into the earth. After a few strides, our shoes had been totally engulved in sludgy mud up to our shins. We were running into a swamp. We knew that the trail was just ahead of us because we saw some runners up on the trails. However, we were apparently off course somehow and we needed to back track. After the mud incident, we got back into the woods and came to a nice aid station where we filled up on some PBJ's and fig bars. From the aid station we ran down a cool little dock area right next to the lake and it looked very tempting to just dive in. I didn't though... From the dock, we headed back into the woods. There were some cool hills through here with an area that opened up and looked like an old canal or something. We chugged along and eventually came out to a big Dam area with a very friendly aid station there to greet us. The sun was shining brightly and the views were awesome everywhere today. We stocked up on some calories and headed back into the woods. These miles were very scenic. We stayed close to the lake most of the time. At one point we cam upon an incredible aid station. Dan had run ahead cause he had to refill on water and stuff, and when he got there, he told them my name. As I exited the woods, I heard everybody yelling "GO LUC!! WAY TO GO!!" It was a great welcome after hearing so much quietness in the woods. I could do nothing but smile and thank them all. They were great! We stocked up and moved along. From this aid station, we took a nice winding road around a bend and then were faced with a hill that went strait up. At the top of the hill, we crossed a road section and scaled down a very steep decline to another trail. We followed this trail for about a mile and then we headed up a another pretty steep incline to yet another aid station. I remembered how great it felt to have people chanting my name at the last aid station, so Dan and I told this aid station too look for Kimba in her bright orange t shirt and cheer her on. This aid station was great and then we headed on back down the hill and into the trees where we would stay for the remainder of the race. In through this section, my feet were really starting to hurt. I had some nasty blisters on my right foot from these new shoes and my left knee was a bit tight when going down some of the steep hills. I didn't let either of them get to me, and I just focused on right foot, left foot. Dan and I separated out a bit and we listened to our iPods for a while. There were some really crazy hills through here. It seemed worse in my road shoes, because as I tried to position my feet on each a leaf covered rock, my feet would slip just enough to freak me out. Lesson learned. Through this section, I was pretty nauseous. I had kept up with my fuel and my water intake up to this point, but through here I was having a hard time thinking about putting anything else into my stomach. Every time I thought about taking a drink, it made my stomach even more sour. It reminded me of my later miles at the Mohican 50 Miler, and that wasn't a good feeling. I poured some water over my neck and that helped a bit... I struggled with it throughout the remainder of the race. We had taken our time during this race, but it was to a point now that we were going to be missing the cut off to get our hooded sweatshirt. There was a 7 hour limit in order to get a free Bobcat Trail Marathon sweatshirt. I was getting pretty bummed about it and was about ready to give up and just shuffle / walk the rest of the way. I was spent anyway, and the trail just kept going and going. It didn't seem like the finish was anywhere near. We'd been in the woods for a long time at this point. This is when the second wind came. We came around a corner and saw a sign that said "1 Mile To Go!". I looked at my watch and it was 2:45 pm. We had 15 minutes to finish this thing and get our sweatshirt. We got this!! I told Dan that I was ready to pick it up and finish this thing. We started running again. We gave it all we had for about a full minute and then we ran face first into a hill that went strait up. What little energy we had summoned had now been spent on this monstor of a hill. I beat the clock by 11 seconds. :) It was a very slow marathon for me (my slowest), but it ended with a perfect finish!! The post race meal was great, I'm sure. However my stomach just wasn't in it, so I donated my meal to Dan and he ate his and mine while I looked on. :) The race experience was simply amazing. I will remember this race for a long time and it felt great to finish strong. Even though I felt nauseous for the last 6 or so miles, I was happy that I ran the last mile as hard as I could and left nothing on the trail. Luc, nice to meet you at the race! And loved the new shooz too! I was the gal with Kim before the start. I also barely made the cutoff and got energized at that one mile to go sign. Way to go! It was slow but we made it! Luc, I really enjoyed the most informative report! Way to dig in that final mile! Luv the pics! I will most certainly keep my options open this time next year -- I really enjoy scenic courses. Thanks! Luc, found your post in my prep for the 2010 Bobcat Trail Marathon. 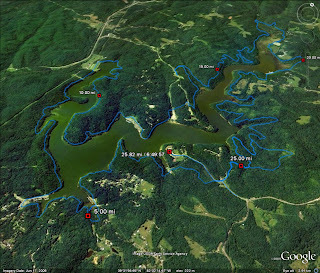 This will be my first major trail run. Do you recommend "trail shoes" for this event? John, Thanks for the comment. Good luck this year at the Bobcat race; you'll love it! The race is mostly trail, so trail shoes would be a better choice than street shoes IMO. Hope this helps and have fun!